Conforms to the USB Type-C Specification version 1.1, 56k ohm pull-up resistor, which ensures a safe maximum charging speed. No damage to your legacy USB hub. The Nekteck Gen 1 USB-C to USB-A Cable is the cable you need to connect your PC or Mac to USB-C enabled portable devices, such as your Tablet or Smartphone. With the USB 3.1 Cable you can count on simple plug and play connectivity. Moving large files or transferring movies can be done in seconds, at 10x faster than USB 2.0, all while charging your device with up to 3 Amp, where supported. It has a transfer speed of up to 5Gbps, eliminating the hassle of any installation or set-up process. The multi-pack comes with different length, make it handy to place devices away from the connection point. Buy the Nekteck 1st Gen USB-C to USB-A Cable right away! The connector has a rated durability of 10,000 uses, making it sufficiently robust for even the most demanding users. This premium cable is also backwards compatible with USB 3.0 and 2.0. One 6ft A to C cable, Three 3ft A to C cables and one 1ft A to C cable combined for a new generation of Type-C devices. Charge or transfer data all supported USB C devices. A durable multi-pack of cables with reinforced insulation designed to withstand everyday stress, bends, twists, and pulls. Apple MFi Certified, which means it’s made specifically to fit with your iPhone, iPad and iPod so you can expect quality performance and reliability. Premium Lightning to USB Charge and Sync Cable with aluminum connector plugs for charging and syncing your iPhone, iPad, and iPod. Standard 3.3 Feet/1Meter in length conveniently designed to accommodate charge and sync while in use. Stylish design and tangle free for easy storage and use. Stand out from the rest of the many cables out on the market. Built for daily use, this single cable solution can backup files or transfer pictures, music and videos all while charging your device. 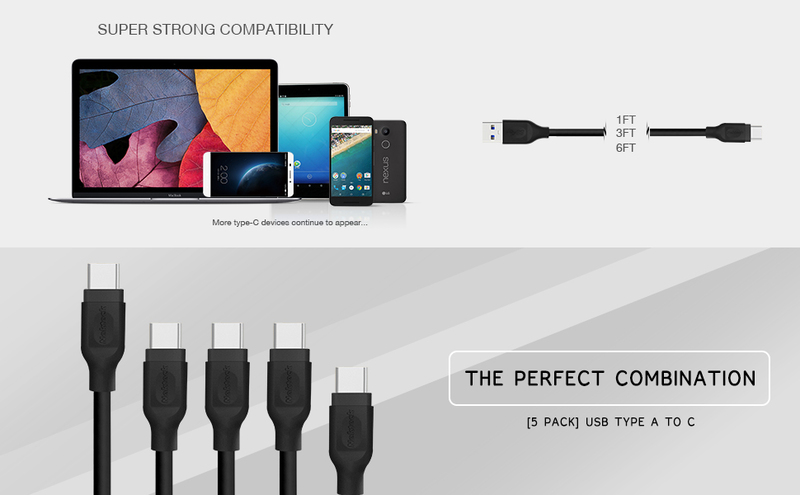 Conforms to the USB Type C Specification version 1.1 and approved by Benson Leung, 56k ohm pull-up resistor, which ensures a safe maximum charging speed. No damage to your legacy USB hub. Reversible Connector: With the latest and most advanced USBC connector allows you to charge and sync USB-C devices and never have to worry about plugging in upside down. High Speed Charging & Syncing with 3A max: Support fast charge with max 3.0 amp charging capabilities from the 3.0A output USB port on wall chargers or car chargers. 3.3 Feet/1Meter in length conveniently designed to accommodate charge and sync while in use. Stylish design and tangle free for easy storage and use. Stand out from the rest of the many cables out on the market. DUAL USB 3.0 TYPE C READER: The Nekteck USB Type C Card Reader has a unique design with Type C reversible connector. It supports both standard USB Type A and Type C port. It’s a great way to have an extra storage for your latest smart devices like tablets, computers and smartphones. You can access your data to New MacBook or PC with the Type C port or Micro SD on traditional Type A devices. How cool is that? COMPATIBILITY: It is backward compatible with USB 2.0 and 3.0 and Window Vista/7/8/8.1/MAC/Android System. USB ON-THE-GO TECHNOLOGY: On-The-Go OTG function allows you to connect to your mobile/tablet devices with Type C that supports USB OTG protocol (USB On-The-GO). PORTABLE DESIGN: It has a hidden Micro SD Card Reader slot with logout switch which is really easy to use. It also has a plastic dust cover to protect the item from dirt and a keychain whole which makes it really handy anytime. Cool! COMPACT AND EASY TO CARRY: The Nekteck SD Card Reader is compact and really easy to carry. It fits in your wallet, pocket, purse and camera bag which is really great for personal or professional use. No driver need – just plug and play! Reversible Connector: With the latest and most advanced USBC connector allows you charging and syncing USB-C devices and never have to worry about plugging in upside down. ULTRA HD MULTI-TASKING: Enable 4K video output from your computer system to a HDMI-enable monitor. The Nekteck USB A 3.0 To HDMI 4K Adapter allows your system to output 4K video even if your system doesn’t have native support for 4K video output. BACKWARD COMPATIBLE: While the USB 3.0 to HDMI Adapter is designed for USB 3.0, it’s backward compatible with USB 2.0. 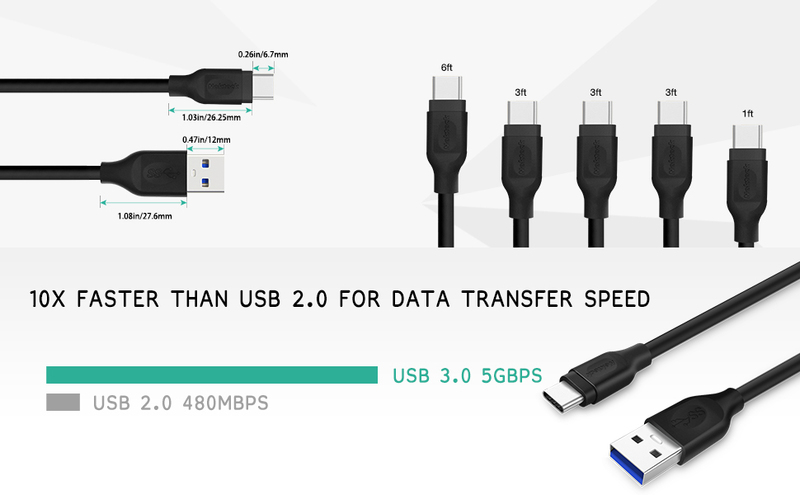 If connected through USB 2.0, the performance may not be satisfied on resolutions above 1080p due to the limitation of USB 2.0 bus bandwidth. DISPLAY LINK 4K PLUG AND DISPLAY CERTIFIED: It is built with DisplayLink’s latest high performance DL-5500 chipset. It automatically downloads and installs the most up-to-date drivers for you, so you won’t have to. USB-C TO GIGABIT ETHERNET NETWORK ADAPTER: The Nekteck USB-C To RJ45 Gigabit Ethernet Adapter allows user’s computer to instantly connect to a 10/100/1000Mbps network through an existing USB Type-C port. No need to purchase an extra Gigabit network card and share a PCI or Cardbus slot. RELIABLE CONNECTION: Harness the reliability of Ethernet for your USB-C device with the Nekteck Ethernet Adapter. Where wireless connectivity is inconsistent, overextended, or even non-existent, this adapter allows you to connect seamlessly and with confidence. With the speed and reliability of Gigabit Ethernet, even the largest downloads can be possible without fear of interruption. TROUBLE-FREE CONNECTION: Never worry about which way to plug it in. USB-C is a new user-friendly reversible connector that allows you to connect your cable to your device in any direction. The plug and play capability guarantees a hassle-free setup for use at home or the office. COMPACT & LIGHTWEIGHT DESIGN: This adapter has a compact and lightweight design which makes a perfect travel accessory. USB Type-C Port: With the latest and most advanced USB C connector, which allows you transfer data and never have to worry about plugging in upside down. Ultra compact Micro USB to USB C adapter provides fast Charging and Syncing through micro-USB cable. Designed and constructed with High-quality materials for ultimate in reliability and durability.